Abraxas is a project by Charly Daicz and Matteo Malavasi. 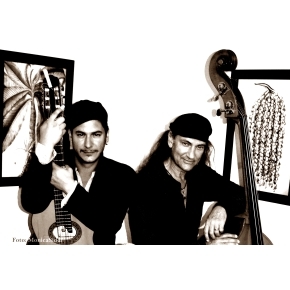 Well equipped with Italian, Polish and Guarani roots, both are extensively educated musicians, being on their sonorous pathway for decades. From Classical Music, Jazz to Progressive House; Flamenco guitar, Iranian Sitar to Violoncello and Bass guitar, their creative force appears limitless. Undeviatingly they follow their inner call, participating in numerous projects with international reputation, studying new instruments and evolving their skills. So it comes with no surprise, that they are nowadays considered as some of Spain’s most accomplished producers and musicians. 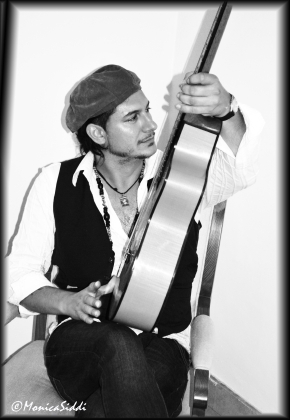 Charly Daicz was born to Polish and Guarani parents in 1975, and began his musical career as a guitarist with a heavy metal band, before learning new styles such as Funk, Jazz, Ethnic Fusions, Latin American Folklore, Flamenco, Indian and Arabic styles. This versatile musician plays the electric guitar, Flamenco guitar, Arabic laud, Mandolin, Banjo, Indian and Iranian Sitars, in addition to being an accomplished multilingual vocalist. Charly has studied with some of the world’s guitar maestros such as Pino Marrone, Anel Paz and Luis Salinas, in addition to touring and recording with Déjà Vu, Juan Bosco and Jorge Dexter. As a soloist, he has performed in many theatres and concert halls worldwide, and participated in the Argentinian “Guitarras del Mundo” Festival. He is considered as an exceptional guitarist, composer and producer, particularly within the Canary Islands where he has been based over the last decade. Charly has an open philosophy towards exploring and embracing new cultures, languages and fusions, which clearly reflect in both his live and studio performances. In 2014, he co-founded the group ABRAXAS with Matteo Malavasi, and the group, with the addition of Pico Piccorelli (percussion) and Luca Pigino (drums) debuted onstage at the Red Mountain Jazz Festival, Tenerife. 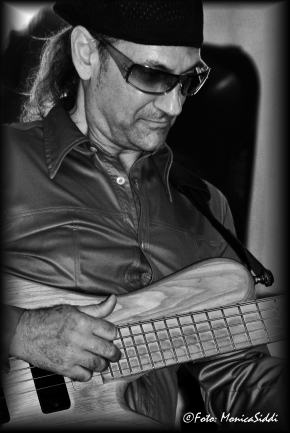 Matteo Malavasi, born in Italy in 1962, had his first contact with a musical instrument in his local church band where he played the guitar. One evening, one of the other young musicians, a bass player, accidentally left his instrument behind after a rehearsal. Matteo was in intrigued, picked up this bass guitar and started to play it. That was the moment in which he became passionate about the instrument which would forge his career. Since then, Matteo has not stopped working within the music industry, learning new skills and techniques from Classical music to Progressive House. Playing both the electric and upright bass, his studio works have featured on national Spanish and Italian Radio and TV, and his live performances with various groups ranging from Jazz to House and Rock have been seen around the globe, including the Blue Note, (Tokyo and Milan) and the Umbría Jazz Festival, Italy. He relocated to Tenerife in 1984, where he spent three years learning the Violoncello, whilst working on diverse musical projects, from Soul Funk to theatrical performances. Very soon, Matteo embraced studio recording and editing skills, and became one of Spain’s most accomplished producers. His recordings have appeared on the Buddha Bar compilations, in addition to numerous collaborations with artists such as Cesare Picco, Latin Sound Community, and producers such as Syncoperecordings. As a co-founder of ABRAXAS, he has entered a new phase in his career, igniting an ingenious musical chemistry between himself and Charly Daicz. 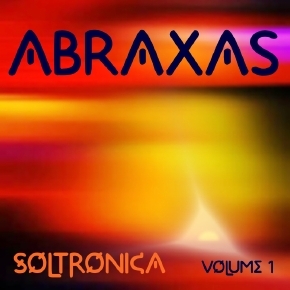 Abraxas’ first album “Soltronica Volume 1” is being released on Lemongrassmusic in February 2015 !